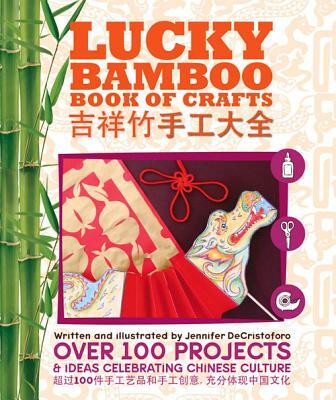 Lucky Bamboo Crafts, 9780988464803, 136pp. China's amazing ancient history, folk traditions, and festive celebrations come alive in this imaginative album filled with fun ideas and creative crafts all about Chinese culture and traditional arts. Each craft can be completed with the reproducible templates and graphics included, along with just a few basic art and craft supplies, paper, and recycled materials. Easy-to-follow, illustrated step-by-step instructions accompany the description and history of each craft. An eight-page cover-weight foldout includes an overview of China with at-a-glance facts and appealing images. The additional project resources include simple Mandarin vocabulary and Chinese character references, along with partial Mandarin translations throughout. Jam-packed with projects for all ages, the book's sturdy presentation has an attractive spine concealed in "bamboo" and handy inside-cover pockets for notes and ideas. Jennifer DeCristoforo is an author, illustrator, teacher, designer, and crafter who has worked in illustration, gift product design, art education, and educational publishing. She has made many trips to Asia and is inspired daily by her daughter, adopted from Jiangxi Province, China. She lives in Yarmouth, Maine.